Bringing order to the chaos of highsec is no easy task. And it's not enough to have skilled, courageous Agents performing elite PvP. To create a civilized society in highsec, we need to develop the theories upon which our Agents carry out their actions. For example, we have "Empty Pod Theory". A worthless, unarmed, implant-less pod autopilots on its own through highsec. Does this constitute a threat? Common sense might suggest that it's completely harmless. But that's why we have theories. Even an empty pod, such as this one piloted by Aika Yaken, contributes to an overall culture and environment of bot-aspirancy. It's a deadly threat to the society we're trying to build. The slightest violation of the Code is grounds for the death penalty. 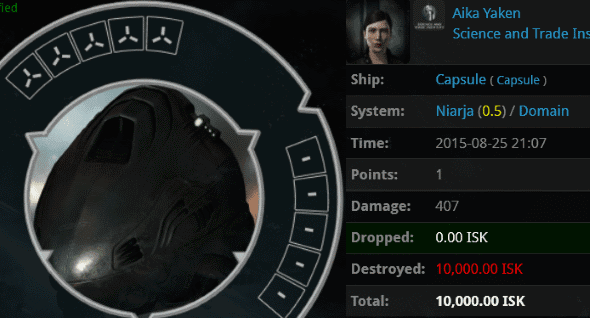 We know from experience that a bot-aspirant carebear who believes in 100% safety in highsec will object to the loss of a vessel worth 0 isk. Agent Pod-Goo RepoWoman surprised the carebear when she ganked her empty pod. Should Aika really have been surprised? Rather than letting it go, or congratulating our Agent on a good fight, or thanking her for the free ride on the "pod express", Aika raged. Aika's tears served as yet another proof of the validity of Empty Pod Theory. Sure enough, Aika was a rebel. 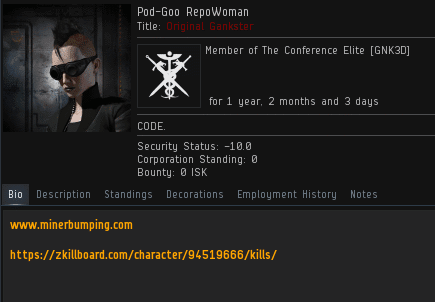 She spread the most scandalous lies about the Saviour of Highsec. You know what's even more dangerous than an admitted carebear? A carebear who doesn't know he's one. Aika Yaken did not acknowledge her bot-aspirancy. She insisted that she was a PvP'er. On another character, naturally. It's the carebear equivalent of "Our princess is in another castle." The carebear always cloaks himself in lies. Aika claimed that she wasn't autopiloting. However, as our Agent pointed out, this would have made the gank impossible. Pods go to warp instantly, so if an alert pilot is traveling in a pod through highsec--where there are no bubbles--how can they die to a Thrasher? The self-professed PvP'er was also stunned when our Agent told her that she deliberately performed suicide ganks. Aika couldn't believe it. As expected, Aika's "main" was too preoccupied with making money to do anything else, no matter how angry she was. PvP'er indeed. Pod-Goo RepoWoman learned so much from this gank. She also had the opportunity to help another player learn from it. Score another victory for Empty Pod Theory. Despite Aika's bot-aspirancy and bad attitude, every highsec dweller's opinion is important. Pod-Goo RepoWoman asked Agent Aaaarrgg to send Aika a standard survey to fill out for our records. New Order science continues to explore and document the carebear mind in search of improved methods of governing highsec. Sounds like that miner really needs to just calm down. Aika Yaken really needs to learn which form of "You're" to use. Look at this depraved miner calling for punishment over and above what is reasonable to justify the hatred they feel, probably at themselves, for not electing a lesser Saviour of Highsec- one who didn't care about them as much as James 315 does. Every time an Agent terminates an illegal miner, they do that miner and all of Highsec a favor; they correct the illegal and incorrect playing activity of that player, and force them into a playstyle that is, unanimously and objectively better than the one they would have chosen on their own. And that's why the Saviour of Highsec, and His Agents, who are inspired by Him, continue to do good, no, great work, every single day, without fail. "the new order is just a group of hypocritical terrorists..."
Sure you can play chess badly each and every game, but eventually you're going to learn how to play it properly, right? As such Eve while labelled as a sandbox has certain rules and styles in play just like chess that evolve over time and which players have to adapt in order to keep up with the rest of the player base. The Code has been going for two years, strength to strength I may add; so if you haven't adapted to the meta and insist on autopiloting through high sec you only have yourself to blame. Try three years. :) CODE. Day was June 24! Come out to Haatomo, announce yourself in local, post up AFK at the bottom belt and I will be there shortly. Preferrably in an anti-tanked Hulk and a good pod. Perhaps you could ask for the survey without first going through the podding process? I'm sure Agent Invicta would accept a PLEX in the cargo hold of your shuttle as an alternative. Empty pod theory? How about the empty head theory of a code agent. How else can the failure of highsec become so popular? Ignorant carebear tears best tears! yet again the only show the tears of the gankee instead of showing what they send to the gankee to get these reactions, alays cutting up chat convo's to make it looks more than it realy is. People are going to play the game the way they are going to play no matter what James 315 says or does. So code, get over yourself. You are not the be all and end all of the game. Not everyone plays the way you do. The code argument of "we ganked them, now they cancel their subscription. They were going to quit anyways, good riddance." does not hold water. If you didn't gank them, then they would still be paying a subscription to CCP. So perhaps the main reason why people are unsubbing is because of code. Granted, CCP has said that ganking is not really a factor, but what they haven't said is whether or not code is a factor. And before anyone says otherwise, this is not tears. And code agents need to calm down. OMG! Yaken "I live in Wh space and kill pilots for a living". Yaken has like zero ZERO ZZZEEERRROOO kills. Another bingo square hit. Sort of like that old saying, how does it go .......... "I have powerful friends in Hedion I haven't met yet!" The Institute of New Order Theoretical Studies endeavors to elucidate the many causes of carebearism. Then perhaps we can work on a cure. Aaaarrgg is adorable and to treat him that way is some kind of sin. How can you break his heart like that? Face it. There are just some players that need to be punched in the face (in game of course) they act so stupid. I really don't know how code agents deal with all this every time they log in. Makes me want to manufacture some Void ammo! He's Still Not Banned Yet?